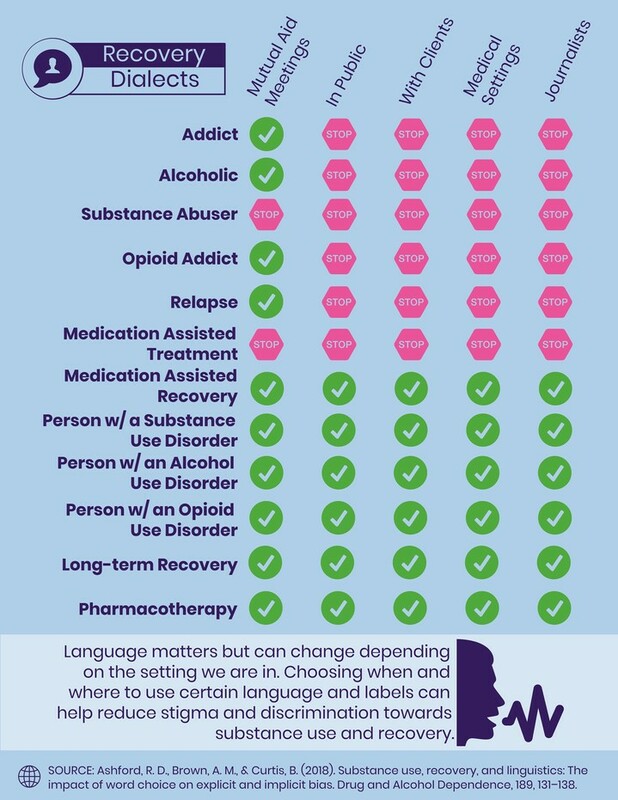 Addiction researchers at the University of Pennsylvania say it’s time to stop using “addict” and “alcoholic” when talking about people with substance use disorders (Ashford, Brown & Curtis, 2018). The recommendation comes out of a new study that found the terms are associated with a strong negative bias. These researchers’ goal was to study the belief that the general public, treatment professionals, and healthcare professionals have been found to exhibit an explicit negative bias towards substance use and individuals with a substance use disorder (SUD). They were also studied terms such as “substance abuser” and “opioid addict” which had been shown to elicit greater negative explicit bias. They also wanted to explore other common terms which had not yet to be empirically studied. The terms “substance abuser”, “addict”, “alcoholic”, and “opioid addict”, were strongly associated with the negative and significantly different from the positive counter terms. “Relapse” and “Recurrence of Use” were strongly associated with the negative; however, the strength of the “recurrence of use” positive association was higher and significantly different from the “relapse” positive association. “Pharmacotherapy” was strongly associated with the positive and significantly different than “medication-assisted treatment”. Both “medication-assisted recovery” and “long-term recovery” were strongly associated with the positive, and significantly different from the negative association. Results of this study support calls to cease use of the terms “addict”, “alcoholic”, “opioid addict”, and “substance abuser”. Additionally, it is suggested that “recurrence of use” and “pharmacotherapy” be used for their overall positive benefits. 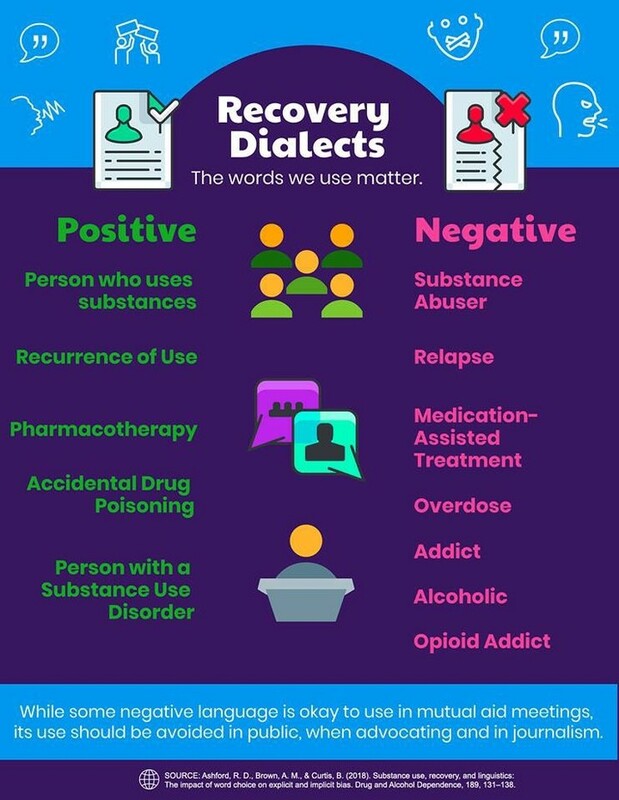 Both “medication-assisted recovery” and “long-term recovery” are positive terms and can be used when applicable without promoting stigma. Steps leading to a behavior targeted for change or relapse prevention work. Series of stimuli/response reactions, ultimately leading to a problem behavior or relapse event. Specific behavior traits that make up and are the causal agents of a problem behavior pattern when linked together. Linked behavior traits with some degree of predictability as to the ultimate consequence or outcome. If the chain of behavior patterns is broken at any point, it probably will not progress to the final behavior. The earlier the break in the link, the easier it is to undo the chain. Behavior chains often go unidentified prior to the occurrence of the final link in the chain. Behavior chains are self‑propelling; they have a momentum of their own to go on and on. The chains can be diagramed, but one must begin with the last link and trace backward to each preceding behavior or emotional cue. Behavior chains can be broken into habitual patterns that give insight into chain‑breaking strategies and alternative behavior traits which help to prevent future relapse. You have had a horrible day at work and are feeling pressured by your boss to either increase daily quota of work or face poor performance evaluation. You leave work in distress, upset over not having been assertive, not standing up for your rights with the boss. In the heavy commuter traffic, you feel upset over course of the day. Driver in the car next to you cuts in front of you, making you shout and gesture to him. You pass several bars and think of a big, cool beer. You honk horn loudly at driver in front of you who has slowed down the pace of traffic. Angry at self for losing temper. See billboard with a local watering hole advertised. You feel the seat belt pressing in on your stomach and you think more about your thirst and desire for a beer to quench that thirst. Depressed over your boss's inability to show appreciation for your good work. Annoyed at the slow pace of traffic. Getting angry and tasting the beer as you pass the twelfth bar. Finally you pull into a bar parking lot. You call home to say you will be late, that you have more work to do at the office. Check your wallet to see if you have enough money for a beers. Angry at self for allowing work, boss, and traffic to upset you. Get into bar and stand at the bar counter. Feel exhilarated when it is your turn to order. Order a large, cool tap beer. Mentally review the day's events as you wait for your beer to come. Get angry again over your boss's rudeness and lack of caring. You feel depressed as you review the route your life has taken: overworked, underappreciated, and taxed by a forty‑five minute commute twice a day. Feeling sorry for self for the hard knocks life has dealt you. Your bottle of beer arrives and you feel excited over your rewarding of yourself; you deserve it! Pay for beer and become intoxicated by the aroma. You drink your first slug of beer. You take a deep breath, feeling rewarded and at peace. You continue to drink slug after slug of your beer and relish each flavor. You force yourself to order another beer. You feel after the second beer is guzzled down, embarrassed: What have you done! Why did you drink two beers? Guilty and depressed since you have been in treatment for alcohol use disorder, you dispose of all evidence that you were at the bar. You drive home feeling hopeless, trapped. Why did you lie about doing work at the office when you were going for two beers? Why did you drink? Why did you threaten your recovery. You hate yourself. You know you need to bring this up to your AA Sponsor and maybe even talk about this relapse event in your AA meeting tomorrow night. How can people control a behavioral chain? In order to control a behavioral chain, the links need to be identified and broken. Interpreting events in one’s life differently so that they are less likely to have the power to lead them to exercise habitual problem behavior or relapse to old behaviors. Using rational thinking about what is happening in one’s life eliminates the "shoulds'' and "musts'' from peoples’ thinking about how others should treat them and how they should treat others. Substituting positive affirmations and positive self‑talk when people are being bombarded with emotional cues or irrational thoughts about themselves, events, or others. Taking responsibility for their own actions, not blaming other persons or events for making them fall into the behavior chain. Substituting alternative, healthy behavior, for those behavior traits that lead to the problem behavior or relapse event. Substituting required activities for antecedent behavior in a chain, such as doing office work, paying bills, cleaning the house, opening the mail, paying attention to defensive driving techniques, etc. Substituting enjoyable activities for antecedent behaviors in a chain such as enjoying a hobby, listening to music, exercising, calling a AA or NA Buddy, writing a letter, going to a movie, reading for pleasure. Substituting positive behavior in a chain of behavior known to lead to habitual problems or relapse events. Reinforcing positive behavior traits and ignoring negative behavior patterns, or substituting new behavior traits for negative behavior patterns or relapse events. Recognizing the behavior that habitually leads to predictable, negative‑consequence behavior chains or relapse events. What beliefs block people from recognizing the behavioral chains in their problem behavior patterns? I never know why I do the things I do. It's beyond me. There is no sense in looking at the causes of my behavior. What's important is to treat the symptoms. I've always done it this way. I will never change. What difference does it make what behavior preceded my problem behavior? All I know is I have a problem I can't seem to shake. It takes too much time to work on analyzing the chain of events leading to my problem behavior. So, what difference will it make to identify antecedent behaviors or events when they are out of my control anyway? I'm compulsive; that's all I need to know to explain why I act the way I do. I'm so embarrassed by the way I act; I'd hate to tell anybody else about it. I am a loser and there is no helping me. If it weren't for ________ (spouse, parent, child, boss, job, problem of the day), these things would never happen. Act of deliberately turning to cues that break unhealthy patterns or habits. How does thought stopping work? What are some thought‑stopping techniques? Yelling “Stop”: on thinking the unwanted thought, immediately yell STOP. The yell can be out loud or only in the mind. Continue to yell STOP until the unwanted thought ceases. Substituting a Healthy Thought Pattern: if people have a tendency to think irrationally due to irrational beliefs, they can develop a rational pattern of thinking by challenging every thought that comes to mind, asking: Is this a rational thought? If not, what is irrational about it? What would be a rational replacement for this thought? Replacement Visual Image: if people have a tendency to visualize negative images, replace these negative images by positive, healthy images. What irrational beliefs block people from letting thought stopping work for them? It's OK if I just think about it and do nothing about it. What's the harm of thinking about it? People will never know if I just think about it for a little while. I've denied myself so much, why can't I just think about it once in a while? You can't condemn me for thinking. I never thought about it before I acted so why should I avoid thinking about it now? It is too much of a battle to fight these thoughts. It's easier to give in and then start over again in the morning. What difference does it make if I think about it? It seems so silly to control my mind from having thoughts about it. This feels like brainwashing and I think brainwashing is bad. 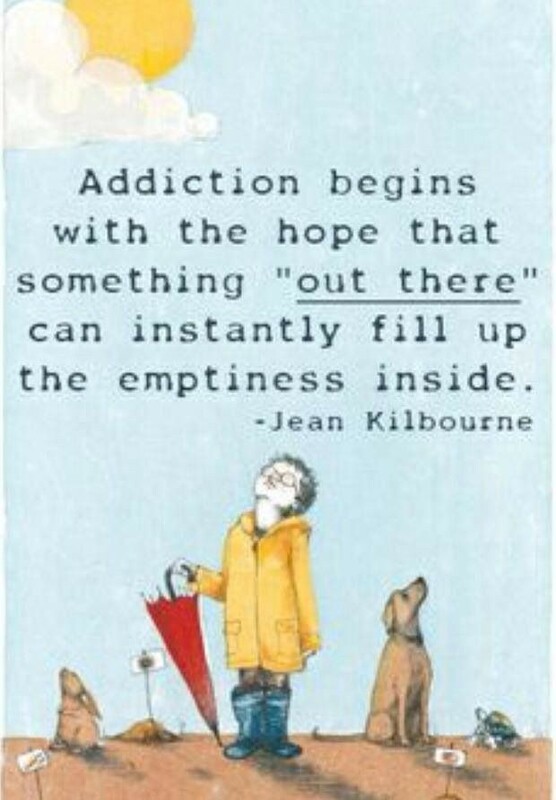 I don't need this in order to be successful in achieving recovery. This is another far‑out psychological gimmick too stupid to try. Step 1: Use relaxation training and breathing exercises to get yourself relaxed. It is important that you be relaxed as you proceed with this process. Step 2: Record the word stop in alternating 1, 2, and 3‑minute intervals on a 30‑minute recording session. Using the stop recording in a relaxed state, think your unwanted thought and every time you hear stop, discontinue the thought. Go back to the thought again and cease the thought only when you hear stop. Do this for 30 minutes every night for two weeks or until you can consistently discontinue the thought when you hear stop. Step 3: After you are trained to arrest your thought using the stop recording, you are ready to try arresting your thought by yelling stop out loud. Think of your unwanted thought for 30 minutes and yell stop to discontinue the thought. Once you arrest the thought, go back to thinking about it for a while, then yell stop again. Do this for 30 minutes each night for two weeks or until you are able to consistently discontinue the thought by yelling stop. Step 4: After you have trained yourself to stop thoughts by yelling stop, you are ready to train your thoughts to end by whispering stop. For thirty minutes, repeat the process of dwelling on your unwanted thoughts but this time whisper stop to halt them. Do this 30 minutes nightly for two weeks or until you are able to consistently discontinue the thought by whispering stop. Step 5: After you have trained yourself to discontinue unwanted thoughts by whispering stop, you are ready to train your thoughts to discontinue by thinking the word stop. Repeat the process of dwelling on your thought for 30 minutes, but this time simply think stop to discontinue unwanted thoughts. Do this for 30 minutes nightly for two weeks or until you are able to consistently discontinue unwanted thoughts by thinking the word stop. The technique of either recording, yelling, whispering, or thinking stop can be effective in discontinuing unwanted thoughts. Ideally you could get to the point where simply thinking stop would work; however, use whichever mode works best for you and keep practicing. Remember to start the process in a relaxed state. People can record in their "Recovery Journals:"